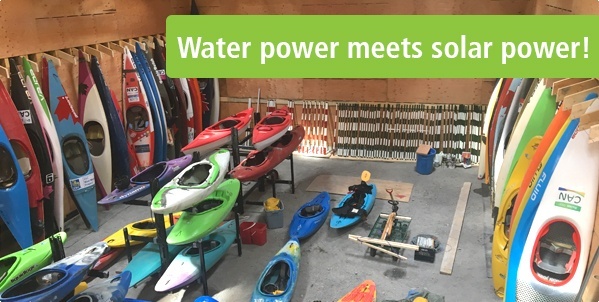 In August, the Ottawa River Runners Whitewater Club celebrated the grand opening of its solar-powered clubhouse, in time for the Canadian Whitewater National Slalom Championships! Launch attendees included Catherine McKenna, Minister of Environment and Climate Change, and Canadian Olympian Michael Tayler. The solar project was made possible in part by support from the Bullfrog community—read on. Win an eco-friendly back-to-school prize pack! Bullfrog Power wants to help your family go back to school greener than ever. We're giving away an eco-friendly prize pack with everything you need to start the school year off right, including items from bullfrogpowered businesses such as MEC, Staples Canada and Manitoba Harvest. Contest ends Sunday, so enter today! "Hayden is among the most airtight buildings in the neighbourhood, which means less energy is needed to heat and power the homes. Currently, Hayden is certified to Built Green Canada’s Gold standard, but [builder] inHaus is aiming to reach Platinum." Read the full story. Many of us have experienced the delight of summer camp at some point during our lives—we may have been a camper, camp counsellor or parent (or maybe all three!). Bullfrog Power is thrilled to have Camp Kawartha, located just north of Peterborough, as a member of our bullfrogpowered community. We recently asked Jacob Rodenburg—who is Executive Director of Camp Kawartha and the Kawartha Outdoor Education Centre—to share his thoughts on what summer camps offer to both young people and the environment in a guest blog post. In this blog post, bullfrogpowered Aspen Clean makes the case for switching to household products made from natural ingredients: "Studies have shown that indoor air is typically up to seventy times more polluted than outdoor air. But what is the cause of this toxicity? One major contributing factor is the chemicals used in conventional cleaning products." Read more. Inspired by a love of food, dogs, and our planet, Midgard Insect Farms raises crickets as an eco-friendly source of high quality protein for pet food and treats. Why crickets? According to Midgard, harvesting crickets uses less water and land than cattle, and contains up to three times as much protein as beef. Learn more at mymidgard.com.